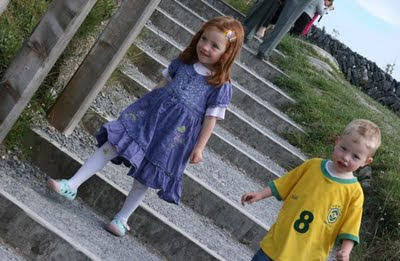 There are a lot of darling children in Ireland, but I ran into these two at the Poulnabrone Dolmen in Co. Clare (more about that soon). They were having the best time! This has been Snapshot Week, and I've been posting photos from my recent trip to Ireland all this week. Scroll back and enjoy! Thanks to all of you who are joining me from DeliciousBaby.com's Photo Friday! All images © Angela K. Nickerson, 2009 and may not be used without written permission. These kids looks ready for an adventure...like they can't wait to move on out of the picture frame. She has the most beautiful hair! They are a couple of cuties! Hope we can make it to Ireland with our kids in the next couple of years. Look forward to checking out your posts about your trip. Gorgeous looking angels. Love the redhair, people always remember redheads more than other colours. like Sharlene I tried copper once but it kind of bombed since I'm a brunette. So cute, and nice angle shot! I second the comments about the hair color. I am with you all on the hair! She was just a gorgeous little girl, and they were having a fabulous time playing together. yeah, they look like little dolls. Ironically, in costa rica there are a ton of really red red heads. Sign me up! The tourism board of Ireland should hire you for advertising.